Now I’m sure that many will agree with the statement that, at least in the literary sense of inspiring awe, sharks are awesome creatures. 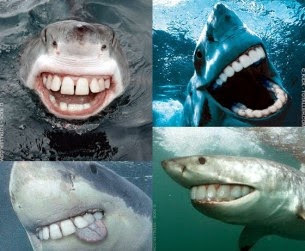 They are one of the apex predators in their environment, the structure of their skin at a molecular level makes them swim faster and they can constantly replenish their teeth in conveyor belt like fashion! As creatures go the shark model is pretty old, about 420 million years old, and yet they also still have amazing complexity. Of particular interest to this article is their highly evolved – if ancient – immune system. Strand model of an antibody, the structural heavy chains are shown in green whilst the light chains that help to form the antigen binding sites are seen in red. Just like us a shark’s immune system is reliant on a class of proteins known as antibodies to function correctly. Antibodies are a class of protein that play a variety of different roles in the body, most notably in their recognition and immobilisation of invading pathogens. This occurs through the binding of small macromolecules, called antigens, to a special recognition site of the antibody. These are typically exposed at the surface of pathogens or else secreted by them. This is however not the only reason many researchers are interested in antibodies. Their ability to recognise very small quantities of antigens with a high specificity makes them useful in bio sensing or as treatments to disease by binding to specific proteins thus blocking their function. For these applications it is useful to have a large amount of such antibodies, and in fact for a lot of fields of biological research (not just immunology), antibodies are a critical reagent in many experiments. The typical method for producing these antibodies is to first induce their production in a model organism, such as a mouse, then extract cells from the mouse’s spleen, fuse them with a myeloma (a benign cancer cell that divides rapidly) and then use this hybrid cell (known as a hybridoma) to produce many copies of the antibody. Following this the antibodies must be carefully purified before they can be used. This is a complicated process and fraught with difficulties, getting mice to make the right antibodies and producing the hybridoma is difficult enough for a start. A better approach is to produce recombinant antibodies by inserting DNA encoding them into model cells such as E-coli or yeast, which are much easier to handle. A big advantage here is that it is also possible to make human antibodies, critical for any clinical work. However this synthetic approach is still tough as many recombinant antibodies are not stable enough to survive purification. This is where the sharks come in. Sharks live in a highly saline environment, the sea, and so to avoid their bodies just shrivelling up through osmosis their bodily fluids contain high concentrations of osmolytes that prevent water moving out of their tissues. One of the major osmolytes in sharks is urea, typically at a concentration of several hundred millimolar. Urea is a powerful denaturant and is a go to reagent for biochemists who want to study how stable a particular biomolecule is. Since shark blood contains high concentrations of urea scientists suspected that their circulating proteins, including antibodies, would be more stable than their human counterparts. This hypothesis proved to be true however it was not just enough to know that they were more stable, they also needed to know how and why. The best way to understand the inner workings of a protein is to have an atomic resolution structure and to get that you require two things; protein crystals and x-rays. What they found is that whilst the sequence of amino acids that make up shark antibodies is very different to human antibodies, the overall shape and fold is remarkably similar. This is an example of convergent evolution, were two different species evolve the same solution to a problem independently. There were however still some important differences. 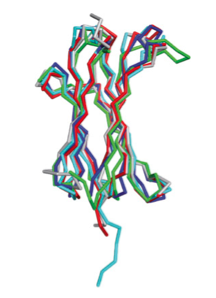 In particular the shark antibodies contained several extra intermolecular interactions at key points within their structure that helped to make the molecule more robust to chemical stress. Armed with this new knowledge the researchers went one step further and modified recombinant human enzymes to now include these extra interactions to test the impact they would have on stability. Happily the stabilisation was transferrable and the modified enzymes could survive in temperatures up to 10 degrees higher than unmodified, as well as being almost twice as resistant to urea. What was most pleasing is that the rate of secretion for the modified antibodies was vastly improved. 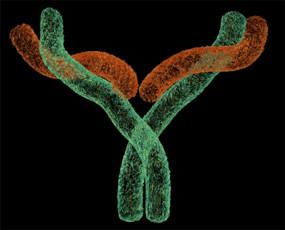 The researchers suggested that this would likely be a boon to the antibody industry and could potentially have significant diagnostic and therapeutic application. This all goes to show that sources of scientific innovation can come from the most unlikely of places…oh and of course reinforces my point that sharks are super awesome. 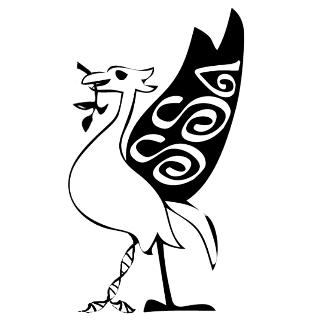 This post, by author Marcus Gallagher-Jones, was kindly donated by the Scouse Science Alliance and the original text can be found here. Feige, M.J. et al., 2014. The structural analysis of shark IgNAR antibodies reveals evolutionary principles of immunoglobulins. Proceedings of the National Academy of Sciences. Available at: http://www.pnas.org/content/early/2014/05/14/1321502111.abstract. This article was so exciting it made me download this file, and now using it just amazing!